As the weather is still beautifully sunny and warm I’m a little surprised to find that we’re now into October; a month that usually signals a definite move from summer to autumn. Here the evidence of the changing seasons is in the crops ripening in the fields; the sunflower’s bobbing heads are dark and without their petals, the maize is cut back to stubble and the hay is baled. 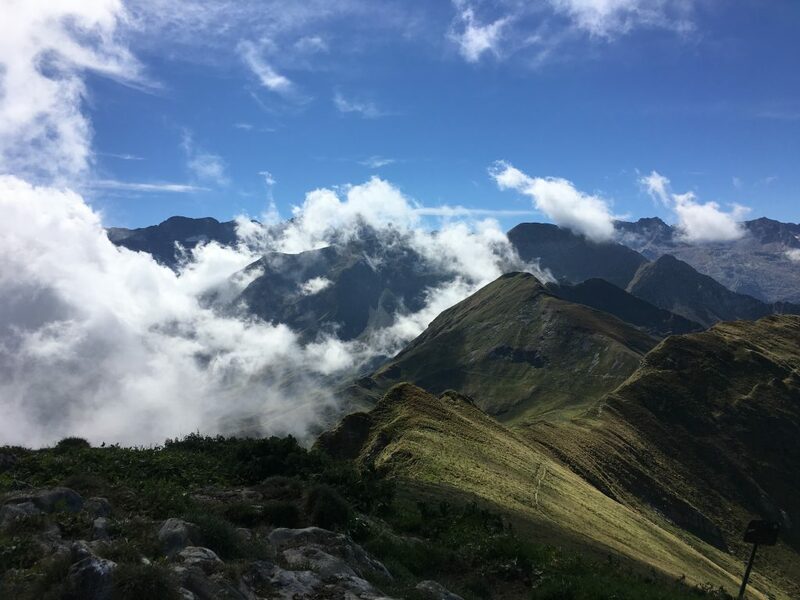 We drove from Aulus-les-Bains to Bagnères-de-Luchon (simply called Luchon on the road signs) – yet another reference to bathing and hot springs. 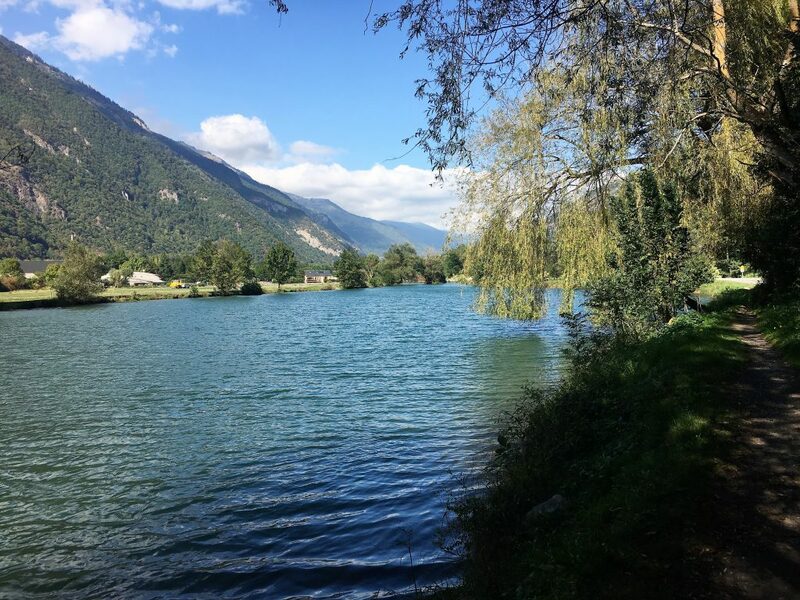 It was a longish drive for us, but a pleasant one along a pleasant valley towards St Girons and then across farm land to Montrejeau, with red kites flying overhead, before heading back into the valleys again. The reason for such a long way round? Well it was the quickest route, but the main reason was a search for LPG. 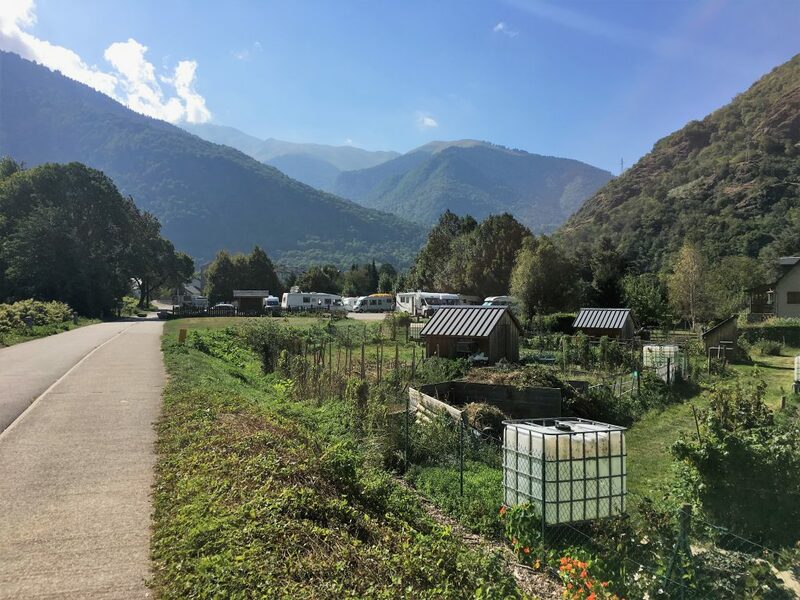 We found the most expensive LPG we have ever bought in St Girons – 81 cents a litre, but without it we are stuck, no fridge, no cooking and no heating. 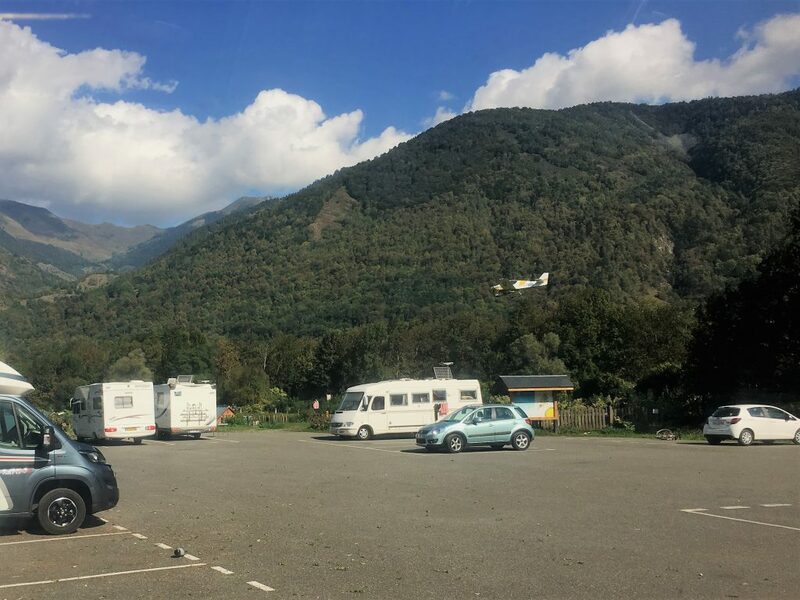 In Luchon the aire was busy with weekend visitors, more motorhomes in one place than we had seen for some time including some Brits for a change. We spent a while trying to work out how to pay for the parking, in the end realising that one of the four buttons on the motorhome service point was for the 5 euro parking charge. 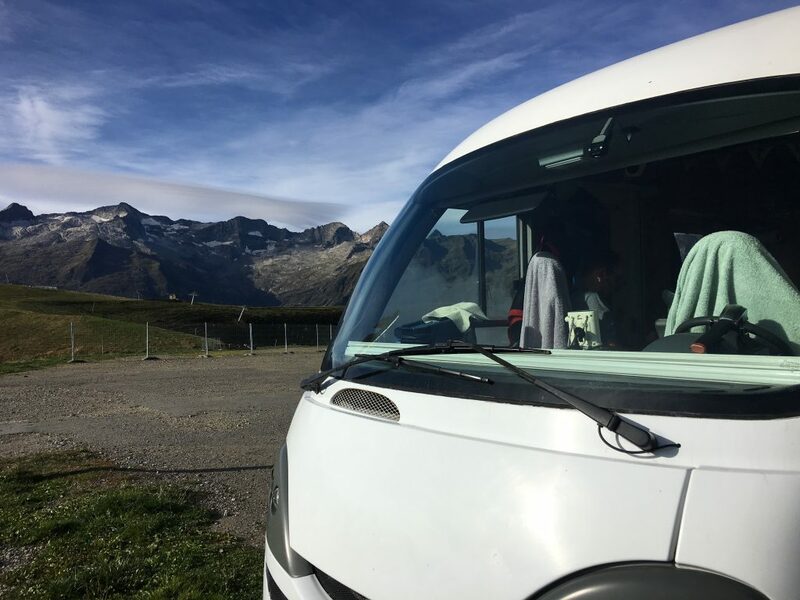 The service point seemed to confuse a few people with one motorhome owner accidentally paying for water which then gushed out uncontrollably as he shrugged and other people dashed out of their motorhomes with receptacles to catch the precious liquid. We took a turn around the lake to stretch out our legs after our drive, but it was a hot afternoon and we soon retreated into the shade of our van where we watched the gliders and their tow planes taking off and landing at the nearby aerodrome. The following morning we managed to successfully use the service point to fill up with water. We chuckled at the group of older gentlemen who spent the morning hovering by the service point with their water containers. They were ready to take anyone’s surplus water and were very friendly about it, chattering away in French to us as we replied in a mix of French and (mostly) English. You cant blame them, the surplus would only end up down the drain otherwise. From Luchon we took a short drive up the road to the ski station of Superbagneres (or super bangers as Paul kept calling it – I don’t know what he had on his mind). The cloud had dropped and started to envelop us as we ascended the switchbacks to the resort. By the time we got there it was looking a bit gloomy and we had no idea of the view that was hidden behind the clouds. We could see the large and impressive 1920s hotel that is the main building up here, sadly surrounded by ugly modern buildings that seem to be half derelict. One building with broken windows and empty holes where the doors should be has a planning permission sign from 2008. Not much seems to have happened to it but the ground floor is still occupied by ski hire shops and the like. We had planned a walk but were in two minds about setting out in such gloomy conditions. In the end we decided we might as well go for it, if the weather turned worse we could always walk back down. 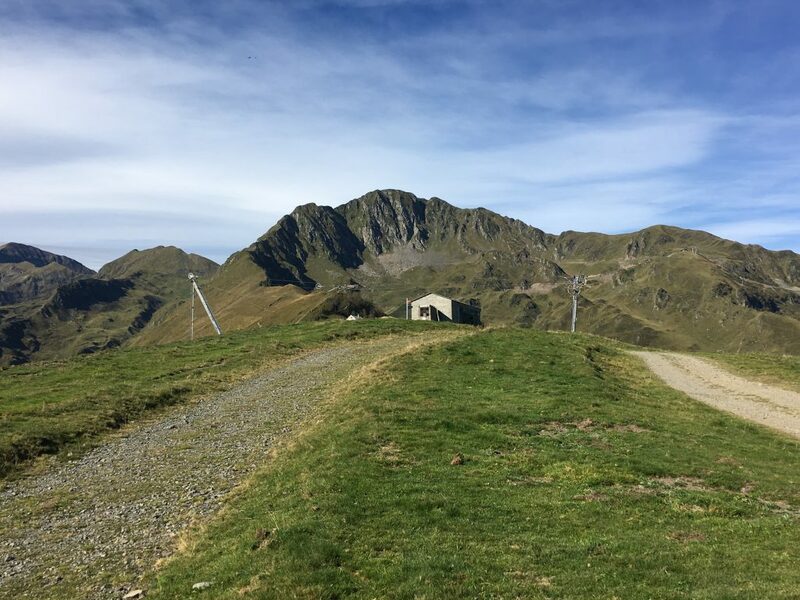 Our walk was to the Pic de Céciré, a mountain top that we should have been able to see from the car park, but the view was sadly obscured. 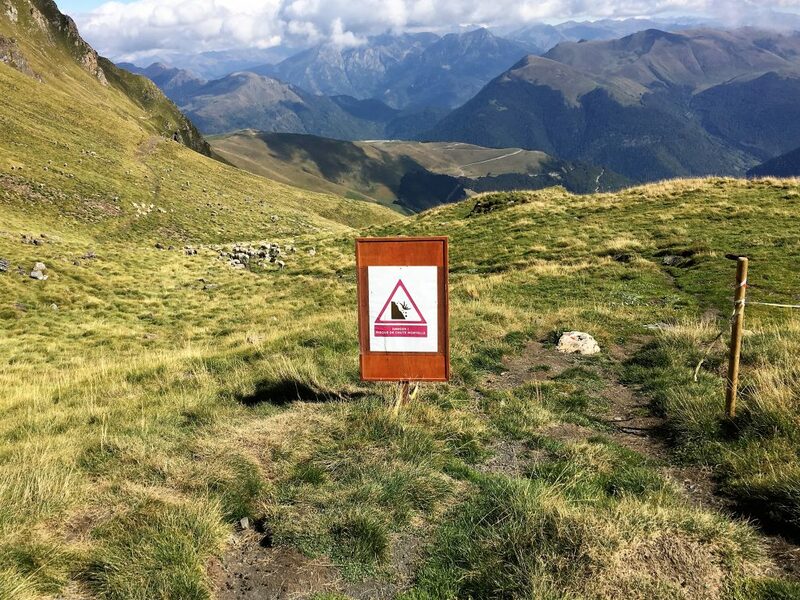 It was an easy route – following the well signposted GR10 which has been rerouted since our map was published. 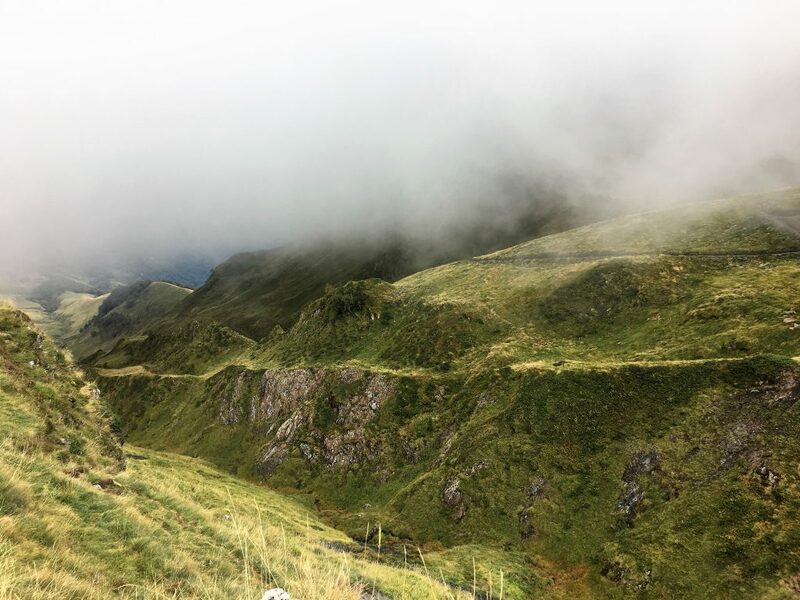 Instead of a gradual uphill traverse around the side of the peak, the walk drops towards the river valley, before making zig zags up a newly scoured path where it eventually re-joins the original route of the GR10. When the GR10 reaches the col, it carries on over the top, but our path to the top of the peak split off to the right. We saw plenty of Griffon Vultures on the way up, forced into low flight by the cloud. As we approached the col at the top of the gully the cloud started to break and we got brief glimpses of the amazing glaciated mountains to our south, the higher we got the more the cloud lifted. We spent half an hour at the top eating our lunch and watching the strange movement of the cloud as it swirled over the col and was lifted like smoke signals by the thermal currents. The way down was a simple retracing of our steps and as we dropped lower the cloud cover increased again until we were completely under it’s blanket of grey again by the time we were back at Bertie. We settled in for a cold night, putting our heating on for the first time that evening and again the following morning just to take the chill out of the air. 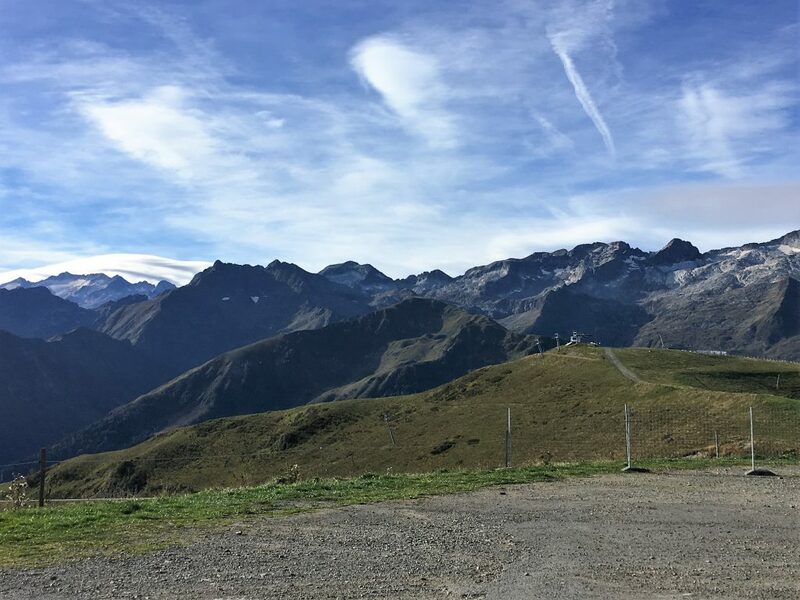 The following morning the sky had completely cleared and we could see the skyline of glaciers and mountains from Bertie. In the distance, across the border in Spain, was Aneto – at 3404m it’s the highest peak in the Pyrenees. Closer to us and still in France was the chain of 3000m peaks whose glaciers we had glimpsed the previous day. Today we had planned to follow a mountain biking route (route 10) round the resort. It was a marked red circular route and had kept me awake at night with apprehension. I don’t feel that my cycling muscles are working very well at the moment and this bike ride went downhill first before climbing back up to our parking spot. Normally a route will start with uphill and I know that if it’s too much for me then I can just turn around and freewheel back downhill. Here I was going to have no such escape route. We cycled up, gaining about 80m as we went towards the top of the ski lift. From the track that circled around to the right we could see the lowest point of the ride, a small reservoir that seemed a long way below us. The downhill from here was steep and stony, once we’d committed to it there was no going back up this route except by getting off and pushing. We managed to skid downhill pretty quickly to where the track followed a more reasonable downhill gradient around to the reservoir. I looked up and could see the steep green banks of the ski slopes, but Bertie was out of sight. It looked like a long way. The next section climbed slowly through the forest. I was glad for the trees masking the extent of the climb with just occasional views further down into the valley. We pedalled on until we came to a fork in the track where we took a right hand turn up difficult switchbacks that would have been very nice on the downhill. Tackling the berms uphill was punishing but bought us out onto a parking area on the road below Bertie with only a couple of hundred meters climb to go. We could have continued off road here, but decided to make it easier and cycle up the road instead. After my earlier trepidation I felt relieved and even managed to look back on the route as being quite enjoyable. I would still prefer to do the uphill section first though!